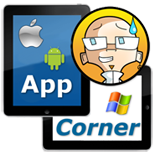 App Corner – Star Walk HD – ScienceMan! This is an essential app for amateur astronomers, but even if you have only a passing interest in the night skies, you should definitely buy this app. Teachers will find this very useful for solar systems images and information. Star Walk HD is incredibly intuitive and fun to use, simply hold your iPad up, and it will match sky with its beautiful display – and teach you about all the constellations as well. Click here for more info at the Star Walk website.